With every year that Digital progresses, we see incremental but obvious transformation. The shifts and changes of the past two decades in particular have set the stage for some major changes in the greater commercial landscape. This week, we explore the past two decades of transformation and what they mean for marketers. 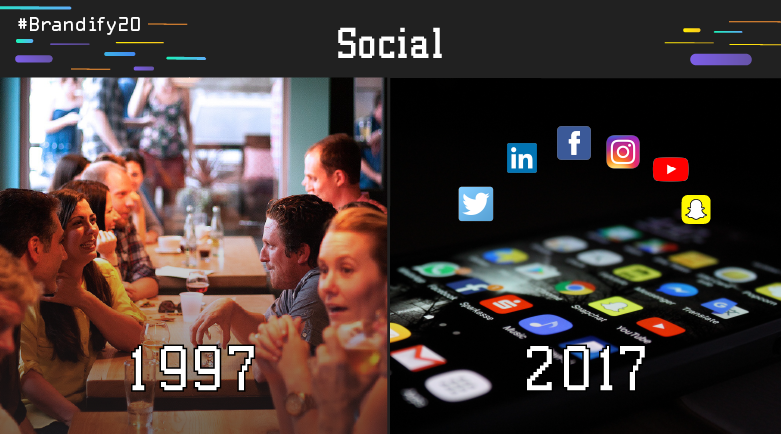 Twenty years ago, the definition of social was far from what it means today. Regular interactions with family, friends and community often were concieved to take place in the real world or, by the stretch of an imagination, through calls made through a landline. However, the focus on the physical element of socialization completely changed in 2002, when Friendster was introduced and expanded to the wider public. This became a landmark destination for new adopters of the internet to come and learn about people outside of their own circle. The transition didn't end here though. After Friendster was superceded by Myspace (2005), and the same was done to Myspace with Facebook, a pattern of deep focus on algorithmic connection buildings soon began to define "social" as we know it today. In 2017, social has little to do with being in the same physical space and more to do with the expansive network, frequent connections and sticky conversations/content that users leave in their tracks on the internet. FUN FACT: Brandify caught on to the wave of social media for Local early in the game. We began integrating important social data for brands like customer reviews as early as 2010 through Facebook and Bing reviews. Nothing has transformed at a more rapid and iterative pace in modern technology than the telephone. While veterans like Motorola note that the first mobile phones were being used as early as 1974, the concept of wireless communication devices didn't truly kick off until over fifteen years after the advent of IBM's smart telephone device-- the "Simon Personal Computer". 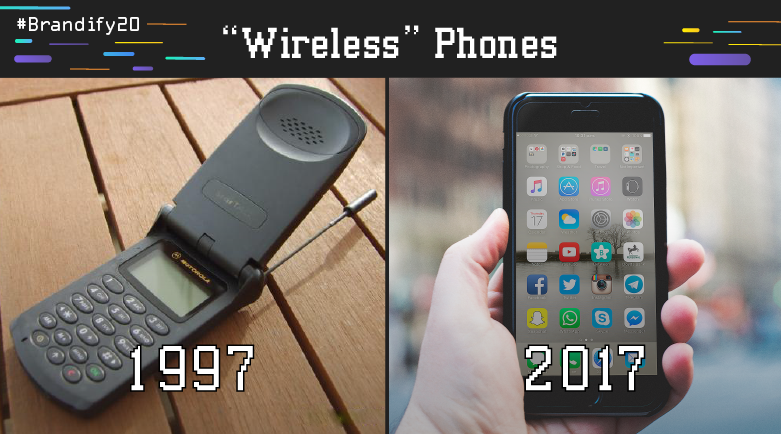 Wireless cellular devices, otherwise known as cell phones, changed the focus away from staying in one physical space with the landline to enabling users to continuously move through their daily lives. Wireless technology not only gave rise to the concept of the mobile customer, but also caught the attention of major players in tech like Google, who began taking smart internet-enabled wireless devices more seriously and integrating device friendliness into its search algorithm. FUN FACT: When Google rang Mobile into its algorithm, the search game changed for good. Brandify began optimizing local landing pages and locators for these wireless connected devices and customers back in 2011, when the early iPhone was slowly being adopted. One of the most buzzed topics amongst marketing pros and working professionals of this generation is the largest age cohort (86 million)-- millennials. These digital natives are the last generation to know a world where physical interaction came first, and yet had exposure to some of the smartest early personal technologies. 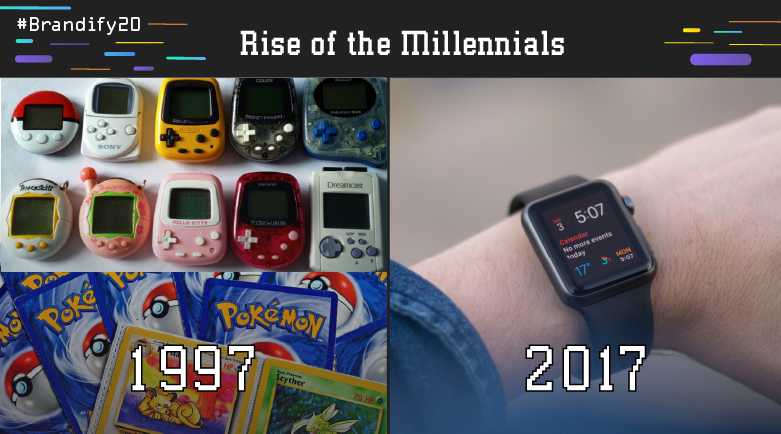 From Tamogachis and handheld game devices, Millennials have transformed into one of the biggest audiences with a growing buying power. Today, we find that Millennials are frequent and regular adopters of new technologies, using their technology across use cases. From business to personal life assistance, to health and goal tracking Millennials are investing screen time across devices and reinforcing the omnipresence of the personalized technologies they grew up with. No more Pokemon, it's all about enabling their location to find the next catch through Pokemon Go and other mobile applications. FUN FACT: Through its twenty years in business, Brandify has taken the skills and talent of digital natives in with open arms. Our growing team is diverse and accounts for both lovers of legacy technologies and innovators who are pushing to adopt new ones. Language shifts to reflect the top-of-mind moments in culture and twenty years ago, the language was far more conceptual in Digital than it is today. Main topics of dicussion back the years before the millennium focused on the early adoption of the internet. 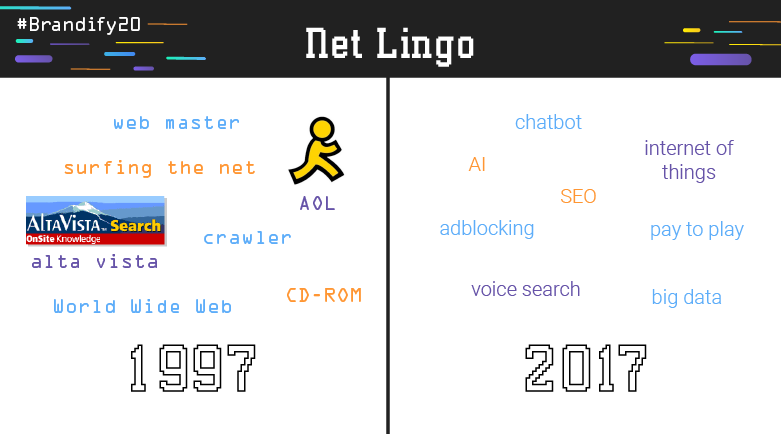 Language was more comparative, helping the slow growth of users relate more to the online world with phrases like "surfing the net" and "crawling" the web. Now, the language of Digital has advanced immensely. Today, people are talking about everything from the adoption of the Internet of Things, to the possibilities of data and voice search. 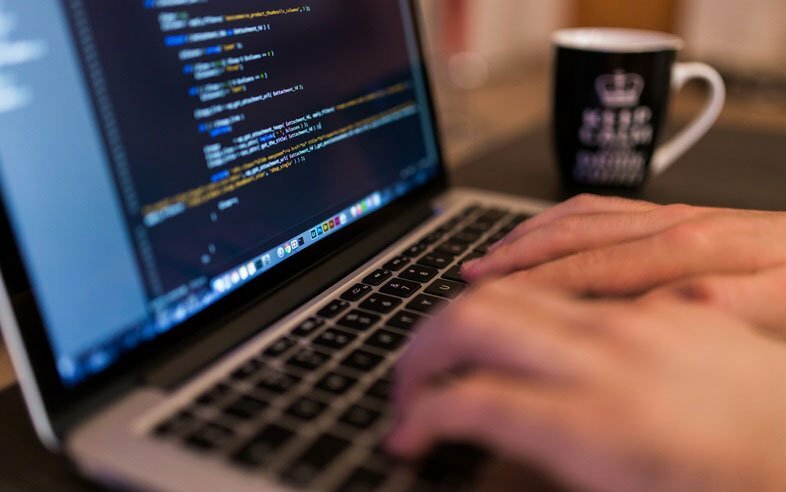 With so many new technologies rising on a yearly basis, technology terminology has simplified to illustrate how it helps the user, rather than a mere concept. FUN FACT: As new terms and phrases make their way into the mainstream, Brandify conducts internal trainings to brief team members on the latest and greatest points of conversation within the industry. From the fundamentals of Mobile integration, to the phenomenon of voice, our team is up to date on all the terms of tech. 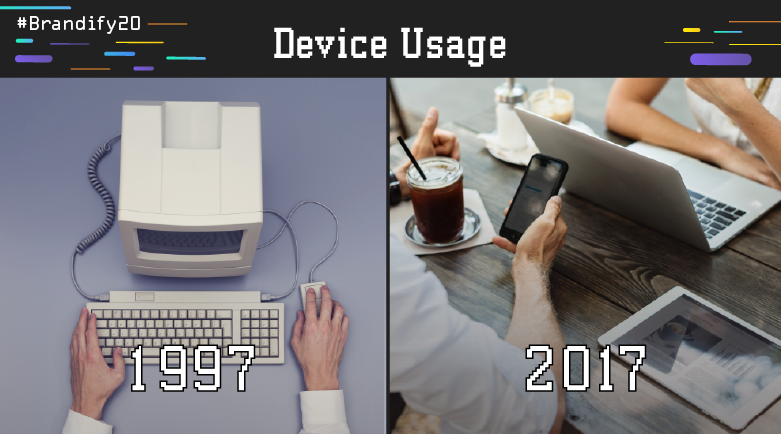 Transformation in device usage indicates a transformation in user needs. While the early desktop was used in the late nineties and popularized after the millenium, the laptop began gaining way into mass adoption by 2012. But at the time of mass adoption came Apple’s first iPhone, a smart device that quickly gained traction and indicated that a mobile user could be even more mobile with the internet at the palm of their hands. Today, we see users experiencing a multi-screen lifestyle, with several devices within arms reach of each other and all with one goal in mind--to remain as accessible to their networks as possible. FUN FACT: At Brandify, we realize that marketers, too, are increasingly mobile individuals. In 2015, we launched the Brandify Mobile - which not only puts our dashboard at your fingertips, but gives you the tools to make your locations accessible to consumers everwhere.